John Yarrow was the third of the ten children of William Yarrow, and his wife Elizabeth Wright of Little Thetford, Cambridgeshire, England. Above: Headstone of John Yarrow, his first wife Ann Whiten, and grandson John Owen Yarrow at Little Thetford. Photo: Andrew Martin. John married Ann Whiten in 1829, and the couple became parents twice before she died prematurely in 1843 at just 34 years old. Widower John then went on to re-marry, this time to Elizabeth Jeffery of Ely, and they soon extended the family with four more children. John and his second wife continued to live in Little Thetford, and he worked as a Publican at "The Wheat Sheaf" (which has long since disappeared) during the 1850's. They were joined here by John's spinster sister Susan Yarrow, who is noted on several censuses as "afflicted" and as having suffered from fits since birth - perhaps this was epilepsy. Susan died in 1886. 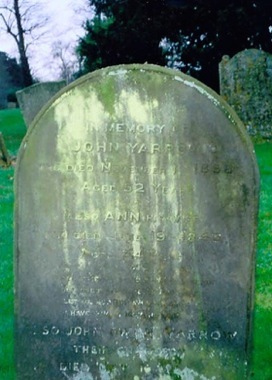 John died in November 1858, leaving his wife Elizabeth to bring up their young family. His Will notes that he left effects under the value of £200 and that his widow and his brother James Yarrow were the executors. By this time, John's older children (from his first marriage) were now raising their own families. His oldest son Owen, was the landlord of "The Three Horseshoes" in Little Thetford, and his son Thomas had become a Sargeant in India where he was fighting in the Indian Mutiny. John's family were not only publicans but were also shopkeepers, farmers, census enumerators, and filled numerous other roles during their time in Little Thetford. 1806 at Little Thetford, Cambridgeshire, England. 23rd February 1806 at St. George's Church, Little Thetford, Cambridgeshire, England. Ann Whiten (1809-1843) on 2nd November 1829 at St. George's Church, Little Thetford, Cambridgeshire, England. Elizabeth Jeffery (1808-1896) on 9th October 1844 at Holy Trinity Church, Ely, Cambridgeshire, England. 1841: 30yrs, Little Thetford, Cambridgeshire, England. 1851: 44yrs, The Wheat Sheaf Public House, Little Thetford, Cambridgeshire, England. 1841, 1851: Publican at The Wheat Sheaf (Public House) at Little Thetford. 1st November 1858 in Little Thetford, Cambridgeshire, England. 5th November 1858 with his first wife Ann, and grandson John Owen Yarrow, at St. James' Church, Stretham, Cambridgeshire, England.